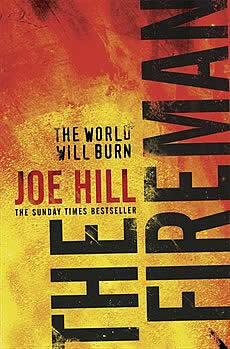 I've always been partial to an apocalyptic dystopian novel so when I read about Joe Hill's The Fireman I was instantly interested. The book has been out for just over a month with mixed reviews. Some thought it was wildly entertaining while others thought it as dull as dirt. Here are three excerpts which sum up the different camps. Have you read The Fireman? What do you think? MSNBC claimed it might’ve been created by engineers at Halliburton and stolen by Christians fixated on the Book of Revelation. But while every TV station debated the cause, the whole world exploded into fire. Pregnant school nurse Harper Grayson has seen lots of people burn on TV, but the first person she saw burn for real was in the playground behind the school. A man in a dirty yellow firefighter’s jacket, known as The Fireman, has learned to control the fire within himself, using it as both a shield and a weapon. Now, in a desperate fight to survive, Harper must learn The Fireman’s secrets before her life—and that of her unborn child—goes up in smoke, along with the rest of civilisation . . .